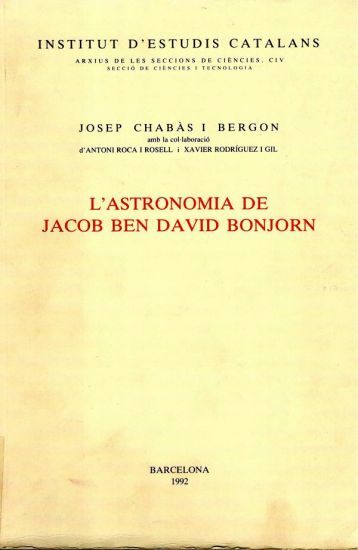 A precise analytical study, with editions of the original versions in Catalan and Latin, of the work of Jacob ben David Bonjorn, an acclaimed astronomer who worked at the court of King Peter "the Ceremonious" of Aragon. He was born in Girona in about 1330, the son of a lady from a well-bred Girona Jewish background named Ester Caravita. His father was a very learned man who was also the royal astronomer: David Bonjorn de Barri, a Perpignan Jew. With his work Astronomical canons and tables, a calculation of the eclipses of the Moon and of the Sun for the period 1361-1391, Jacob ben David Bonjorn made key contributions to the astronomy of his day. He is today considered as an important source for any in-depth analysis of the science of his time.